Frightening commutes are no fun for participants. Commuting to work or school is not always a pleasant experience for most people. But for some, it can be a daunting task that puts their patience and even lives at risk. While time is the most concerning factor for most people when it comes to commuting, there are some terrifying examples of commutes that cannot even be imagined by most people. 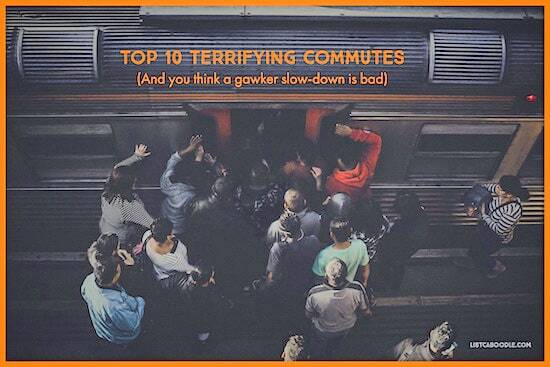 Here are the top 10 frightening commutes from all around the world to give you an idea of how difficult things can be. Yes, you probably don’t want to be drinking hot coffee on these trips. If you live in Los Angeles, the next time you plan your holiday vacations make sure to hit the road before others do. That is, before the next 51 million Americans hit the road before Thanksgiving. Those are the figures estimated by AAA. The road becomes completely gridlocked and it can take up to 3 times longer for you to reach your destination. The 51 million estimated people are expected to travel just 50 miles to their holiday destinations. Commutes to schools are meant to be safe and sound. Imagine your kids having to descend a mountainside on an old wooden ladder to reach their school. That is exactly what happens in a Chinese village known as Atuler. The village is located on a cliff top and the children have to climb down half a mile everyday to reach their school. The commute to school is a 90-minute ordeal with heavy schoolbags on their back. Atuler has 72 families and has lost around 8 of the villagers to the steep climb. It was only recently that the Chinese government stepped in to make this commute safer, but not by any modern standards. The authorities replaced the old wooden ladder with a metal one and the children still have to follow the same old methods to climb up and down. Everyone wants to maintain their personal space during their commute on the subway. Those traveling to work in Tokyo trains don’t have to worry about it. They are pushed and shoved against other travelers, so hard that many find it even difficult to breathe. And this is the normal every day morning routine in Tokyo. You can’t complain against this inhuman treatment to anyone because the government itself employs official oshiya (pushers) to push people into an already crowded train. Tokyo is one of the most expensive cities to live in the world. Houses in downtown can cost over $45,000 per square meter. Tens of millions of those working here commute to work from its suburbs. And train is a cost-effective way to commute to job every day. A small village in Colombia, Los Pinos, is cut-off from the rest of the civilization due to is remote location in the mountains. The village’s children have two ways to reach their school. The first is to take a 2-hour hike along the mountainside. This path takes them down the canyon. The quicker way is to choose the zip line. The zip line uses a half-mile long cable to transport children to their school. The only problem is that the cable hangs 754 feet over the deep canyon. And the children can reach speeds of over 55 mph when they descend into the town. What makes this mode of transportation even more frightening is that it is not maintained by the government authorities, but by the locals. Small children are placed inside a sack to ensure their safety as they zip down at frightening speeds. The zip line is also used by adults to reach the town quickly. The next time you are stuck in traffic during your daily commute, all that you will have to worry about is the slow traffic, not the steep climb. Imagine being on the in Japan. This bridge is frightening for its steep incline. It has a high gradient of 6.1% and is more than a mile long and 11.4 meters wide. The bridge is located between Matsue and Sakaiminato and the road gives an impression to take you into the sky. Imagine if your village has to build its own road to connect with the nearest town. That is what happened 30 years ago when the villagers of the cliffs around Hubei Province built their own ‘Sky Road’. It is terrifying, not just for the height at which it is located but also for the numerous zigzags it has. It is the only connection these villagers have with the outside world. The 2.7-mile long road makes its way down into the valley. The Sky Road has been carved into the mountainside and has an asphalt and concrete surface. The gradient is designed in a way to increase safety by preventing people from driving off it. Also called the Heaven Road, it resembles something of a jade belt. Whether you are driving up or down, the views from the high altitude can be mind boggling. The Yungas Road in Bolivia is also known as the Road of Death. If you are a trucker transporting goods between Chulumani, Coroico and La Paz, this 35-mile Road of Death is a part of your regular commute. According to a 2006 estimate, at least 200 travelers die every year on this road. And the tally includes cyclists too. It is a single-lane road with few and far guard rails on its sides. And most of the road has a width of not more than 10 feet. It rises to over 2,000 feet in some areas, making it impossible for those with fear of height to travel on it. And if that is not frightening enough, it is located in a region that experiences plenty of rain. Even if you could summon the courage to take a trip on the Yungas Road, don’t do it in the rainy season. November to March is the rainy season and the region remains shrouded under fog on most of the days. The unpaved road turns into a muddy mess, further putting the traveler’s life at risk. Even during the summer visibility is affected by flying dust. Rock falls can occur any time of the year. You will also come across cross markings on the road that indicate spots where vehicles went off the side. The residents of Yushan, a remote mountaintop village in Hubei Province in China, have only one way to connect with the outside world – a zip line that is 0.6 mile long and overhangs a 1,600 feet gorge. This village has high cliffs and deep valleys all around it. The zip line has a basic design that was installed in 1997. It features a steel cage and is also the only method of bringing supplies to the village. The ropeway has been maintained by the same person since it was installed. And no one else wants to take up the job. Part of the job is to lubricate the entire length of the cables and the person does this in a cart. The authorities are currently working on building a road to connect the village to the outer world. Indonesia is one of the most populous countries in the world. With densely populated cities, commuting to work is one of the most difficult tasks here. This has made the train surfers of Indonesia infamous all over the world. During peak hours, more than 400,000 commuters can cram in and on a train. There are many reasons they do it – to avoid paying the fare and to avoid the crowded conditions inside the carriages. The country’s capital, Jakarta, has over 27 million residents living in both downtown and its suburbs. You cannot imagine using its roadways to commute, as the gridlock continues to keep getting worse every day. Train surfing is the only way for the country’s young to get to their destination quickly while being able to find a seat. The local authorities have used all kinds of measures to deter commuters from climbing onto the roof, without any success. No matter how dangerous all these commutes are, they don’t involve anyone trying to make a dinner out of you. This video of a marine iguana making its way off the beach on Fernandina Island shows how safe things are for most human beings. When the iguana makes a dart for the craggy rocks to save its life, dozens of racer snakes emerge out of the cracks and give a chase. Even when caught by several snakes, the iguana doesn’t give up and gts out of their hold to make its way up into the rocks, to safety. It is a part of everyday life for the iguana and its kind to live amid these racer snakes. And a stroll across the beach could prove to be their last. But that is a reality of the animal kingdom. What is intriguing is that even in this modern age where humans have touched the moon, millions put their lives at risk to commute to work or school.